At Wisteria, I began writing for the monthly catalog starting with the 2013 January Issue. Here are some highlights (and some of my favorites) from over 3 years of catalog development. In 2016, marketing wanted a stronger emphasis on telling stories throughout the catalog that highlight the core values of the brand. The top right corner copy is an example of one of six stories we told. Here's an example of some of the more creative writing I've done for the catalog. This is the opening spread, which is approved by the President of the company, the VP of Marketing, and the Creative Director. For 2015, the company began focusing on brand attributes for each month. The example shown is for travel, under the "Sew Much History" tagline. Anytime we do features like these, it's my job to research the vendors and products to make sure we showcase the right items. 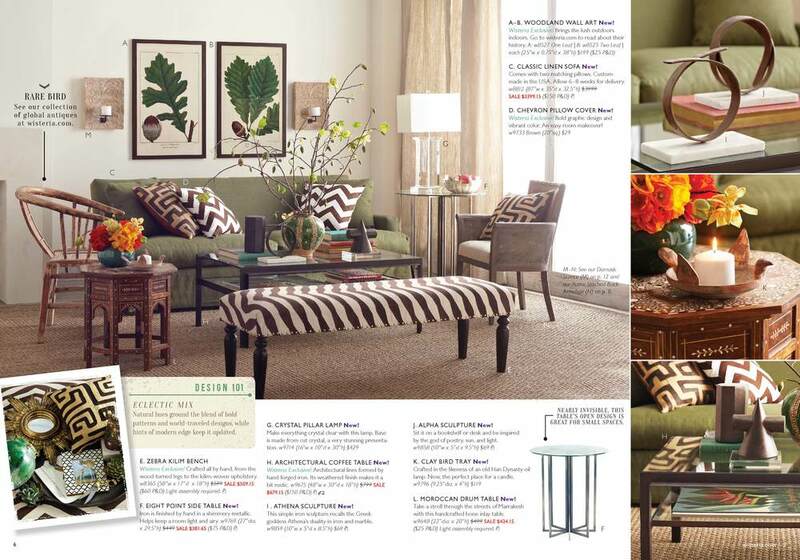 Every year, our August catalog features our August Furniture Sale. To highlight furniture pieces, the catalog designer and I used a copy treatment for "A study in..." to add value proposition and background to a piece on that spread. You'll also notice we have "The Backstory," which fulfills the brand attributes of historical relevance and travel. I began writing the opening letter in lieu of our Senior VP resigning. Our Brand team wanted to focus on getting people in the mood for summer, especially with the rather chilly year we had been experiencing. Inside the catalog, we featured vendors from all over the globe to capture the travel aspect of summer and focus on special Wisteria Exclusive items. The idea with this campaign was to get the reader into refreshing their home for the new year. I came up with the idea to have a standard "re:" headline treatment through the book to capture that, as well as an "In the Details" feature to highlight all our new storage items. Here's a good example of the various branding elements I wrote for the holiday catalogs. We really wanted to incorporate an artisan story to emphasize the giving-back part of our brand, as well as begin to establish our relevance in the small spaces market. Our fall catalogs showed a new face of Wisteria. The spreads were fresher, more modern, and gave more emphasis to the photography. I came up with the idea to do the "Design 101" element, a way to teach the reader how to put together the new Wisteria look and keep our existing customer base. This was a really fun book to put together. Our team had to come up with a solution for the launch of our new stoneware collection. It was my first experience with putting together a concept for the opening spread, so I learned a lot. This was the first issue I wrote the interior branding for (except for the opening spread). I worked with my Creative Director, Jim Starr, on editing and guiding it through the approval process. It's always fun to work on a January catalog because everything feels so fresh and new after the holidays.